People have baggage. There isn’t a single human being who hasn’t experienced hurt in their past. Bottom line, we all have experiences… positive, negative, and neutral. Moment by moment, you have the choice of whether to allow your experiences to dictate your present, or to be active in creating the life you want to live. While it can be beneficial to acknowledge your history, let it not loom over you any longer than you decide for it to. And while we’re on the subject… your past isn’t all bad is it? So why is the pain from the past so much more present in our minds moving forward? It’s equally important to acknowledge life’s wins and all of those feel-good moments you cherish in your memory. So how can you prevent your yesterdays from determining your today, and then ultimately shaping your future? 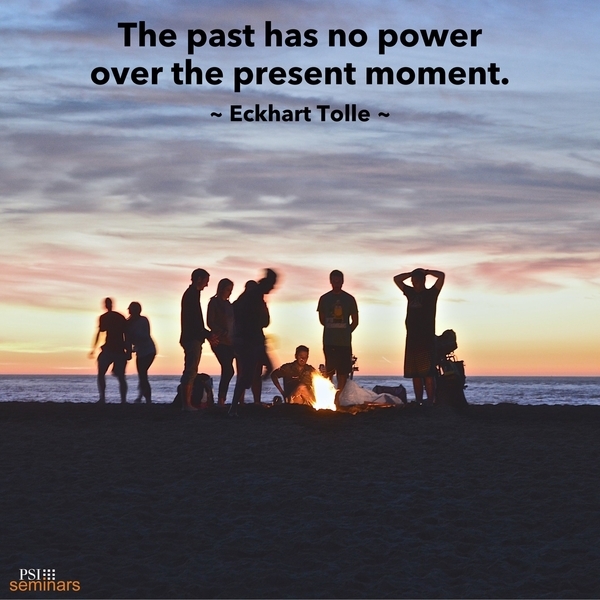 Living in the present moment does not diminish your past, it allows you to maintain power in your own life… after all, it belongs to you and no one and nothing else. Create a mantra for yourself. Make today the best day possible, so tomorrow can be too. Start your day off with encouraging quotes like this one delivered to your inbox every day! Subscribe to the PSI Seminars Thought For The Day here.